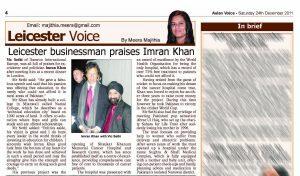 Leicester businessman Vic Sethi of Daewoo International (Europe), was full of praises for ex-cricketer and politician Imran Khan after meeting with him at a recent dinner in London. He gave a fabulous speech and said that his passion was offering free education to the needy who could not afford it in rural areas in Pakistan. Mr Khan has already built a college in Minwali called Namal College, which he describes as a “technical education city” based on 1000 acres of land. It offers co-education where boys and girls can study and are offered scholarships. Politics aside, his vision is great and I do hope every leader in the world thinks in investing in education for children. 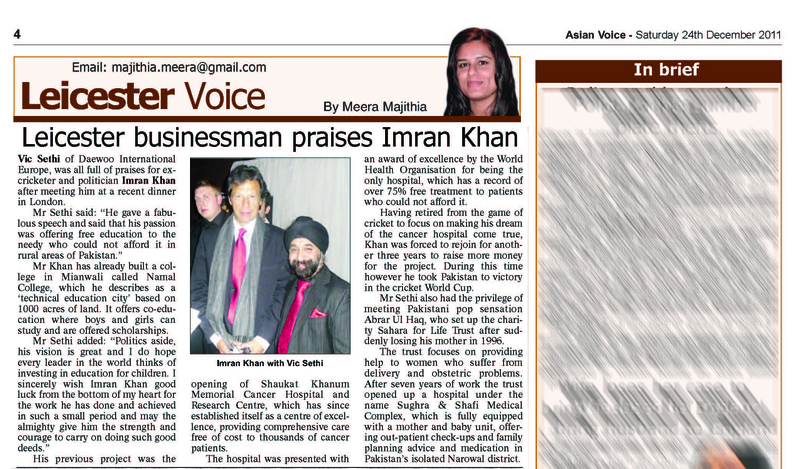 I sincerely wish Imran Khan good luck from the bottom of my heart for the work that he has done and achieved in such a small period and may the almighty give him the strength and courage to carry on doing such good deeds.